I love to cook. I love to experiment with vegetables from our CSA and vegetarian dishes but I also enjoy preparing dishes from all over the world. Heat the oven to 220C/425F/gas 7. Mix together all the spices in a bowl. Put the sweet potatoes and chickpeas in one large bowl and the cauliflower in another. 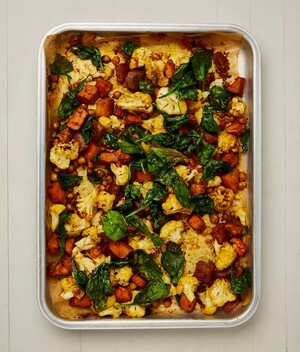 Put two-thirds of the spice mix, half the garlic, three tablespoons of oil and half a teaspoon of salt in the sweet potato and chickpea bowl, toss to coat, then spread out on a 30cm x 40cm baking tray lined with greaseproof paper. Put the rest of the spice mix and garlic, two tablespoons of oil and half a teaspoon of salt in the cauliflower bowl, and toss to coat. Roast the sweet potato and chickpeas for 10 minutes, then add the cauliflower to the tray, stir and roast for 15 minutes more, until all the vegetables are soft and golden brown, and the chickpeas are crisp. Mix the spinach with the remaining tablespoon of oil and an eighth of a teaspoon of salt, and spread out on top of the vegetables. Return to the oven for a final 10 minutes, until the spinach is crisp, then leave to cool for about five minutes. Drizzle over the lemon juice, gently mix together one more time, transfer to a platter and serve.